In 2007, I wrote this piece about my mother, Marian Coleman Ailes (1933-1977). With Mother's Day here I thought I'd republish it. I am so very grateful for her life. 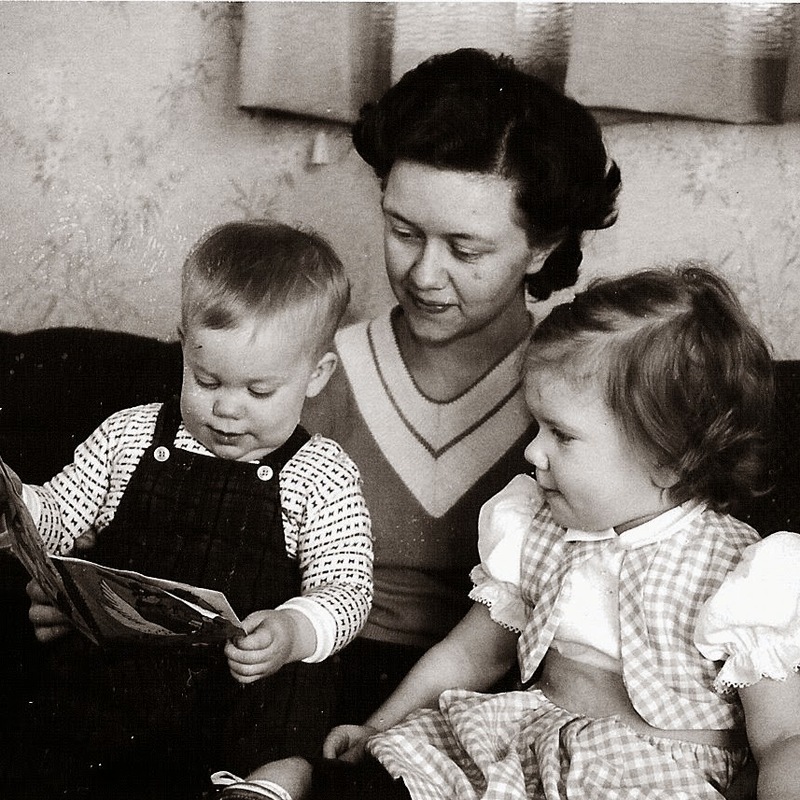 My brother and I with mom, circa 1964. This past week was my mother's birthday and it's caused me to reflect, as I often do on her birthday. She was the one most responsible for bringing me to the Lord. She was a devoted Christian Scientist who had an extraordinary transformation in her life when she came to Christ in 1974. She impacted so many people around her. Not long ago, my dad told me that in the last years of her life, when we were living in Hawaii, she use to go the local Episcopal Church for Eucharist and prayer. I had no idea - my first introduction to the Episcopal Church was when I first walked into Truro in 1979. But according to dad, she was on the Canterbury Trail. I can certainly see that now. She won a full four-year scholarship to Smith College in the early 1950s (her college roommate was the poet, Sylvia Plath), but she hadn't been there long before she found that the school was teaching a radical secular humanism which she totally rejected and so she resigned her scholarship and put herself through college, graduating from Hunter College in New York City while working at McGraw Hill. When we were living in Charleston, South Carolina (1971-1973), we were all still devout Christian Scientists. We only saw the Christian Science Practitioner when we were sick (though we were all immunized, and I do remember my dad giving me aspirin when I had a fever). Yet, my mother was all ready searching—she had tried out Edgar Casey and Transcendental Meditation (that was an interesting time) and then thought it might be a good idea to have an inductive Bible Study on Sunday mornings before the service began at the First Church of Christ Scientist in downtown Charleston. That went on for a while and she a got a good group together—only they were studying the Bible without the Science and Health by Mary Baker Eddy (just not done). They were just actually reading it - the whole thing, not just the bits like the Science & Health instructed, each week. Somehow the "Mother Church" in Boston got wind of it and told her to shut it down. That sure left a lasting impression. Why did this beloved church suddenly get so put-out because some lady in Charleston wanted to study the Bible with a bunch of other Christian Scientists? Was it dangerous? It had them scared to death and they shut it down. She was pretty ticked off about that. I wasn't so unhappy because we were coming to church early and I had to hang around for an hour being still. We moved to San Diego and she got so sick with cancer and through friends back east, a local pastor from the United Methodist Church (who had no idea she was a Christian Scientist) came to visit her in the hospital and shared the Gospel with her, not only in word, but through friendship. After a year of conversation, she made a commitment to follow Jesus rather than Mary Baker Eddy and we gave up going to the Christian Science Church, after four generations in my mother's family. She then started praying for her family, for my dad, my brother and me. I was a particular challenge in that I was wanted to grow up as fast as I could so I could be a flower child and move to San Francisco with flowers in my hair (of course, by the time I would actually be old enough to do that the flowers would all be gone, replaced with Disco balls). But I was pretty determined to be rebellious (I escaped to an Alice Cooper Concert on my twelfth birthday, but that's another story). 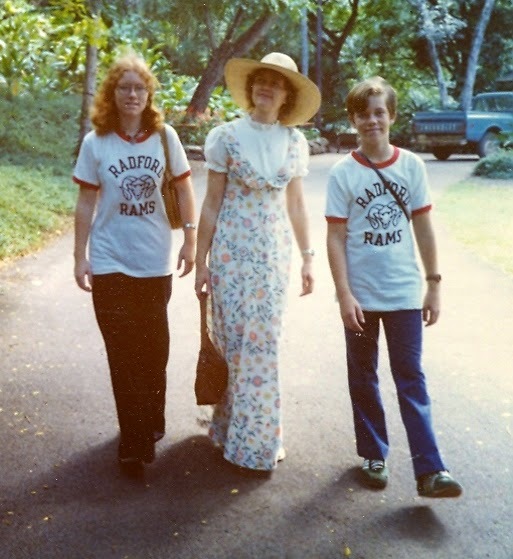 My brother and I with mom in Hawaii, circa 1977. So she was praying, and getting all her friends to pray. Finally, she persuaded me to go to a Christian coffeehouse sponsored by this pastor's church. It turned out it was a Methodist church in renewal and reaching out to to all the hippies floating down the coast from San Francisco to San Diego. Of course, the Jesus Movement was in full swing. Bob Dylan was about to be hit up north in LA and Bono was experiencing his version in Ireland (and surprisingly, even Alice Cooper would come to follow Jesus too). At the time, though, I just couldn't believe it when mom said that I could stay out until midnight as long as I stayed with her designated people (who looked like hippies to me). I thought she had either lost her mind or she'd become, like, the coolest mother ever. So I did it, I went, and well, that changed everything for me. We moved to Hawaii and mom's cancer returned and it was a great challenge for our family. But we stayed together, laughed together, cried together, prayed together, and somewhere along the way my mother and I became friends. Very good friends. In her last weeks we started each morning off, before I went to school, with Bible Study. She was teaching to the end. I try to live my life in a way that I would hope would honor her. In these rather tough days, I think about her and her little Bible Study in Charleston, and the Mother Church up north and all that it led to. God turned a defeat into a brand new life. And then He did it again. And again. And again. And He'll do it again. That's His Promise. Thanks, Mom, I do miss you. Thanks for giving me life - and showing me the Way to Life. I hadn't realized that you moved to Charleston just as I was getting amrried and left. Love Charleston - lived their twice. First time on James Island (1965-67) and the second time in Mt. Pleasant (1971-1973). Great place to be a kid.